It’s the opposite state of affairs in Massachusetts and New York. Their residents marry late — half of ever-married New York men were older than 30 when they first wed. 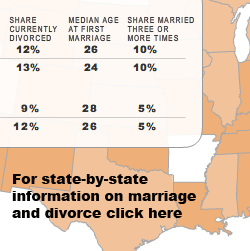 These states also have below-average shares of men and women who divorced in 2007-2008. Remember the classic country song: “All My Exs Live in Texas”? Well, George Strait was on to something. Looking at numbers, Texas is indeed home to more thrice-married adults than any other state, about 428,000 women and 373,000 men. But that’s partly because it’s home to so many people, period. Looking at rates, about 6% of Texans who ever have been married have wed three times or more. That is similar to the national average (5%), but well below the leaders in this category — the neighboring states of Arkansas and Oklahoma — where about 10% of all ever-married adults have had at least three spouses. idents who said in response to a survey that religion was “very important” in their life.4 However, this analysis did not find a strong association between a state’s religiosity and its marriage or divorce patterns.